Schettino and Williams, Manhood and Failure – I Commend Joy! We are all very familiar with the Francesco Schettino after last week’s horrible accident in the Mediterranean Sea. One merely mentions his name and thoughts are recalled in much the same way as when one would mention the name Benedict Arnold. His handling of the crash and it’s aftermath, and the subsequent reflection on his manhood are addressed very well by Al Mohler’s article, The Chicken of the Sea: A Modern Tale of Fear, Failure, and Cowardice. I would like to compare him to another man who has experienced failure in the past week, Kyle Williams. Now before I bring up the comparison I want to make it clear that I am not comparing the circumstances – nothing could compare with the horrible accident that to this point has cost 16 people their lives, along with the millions of dollars and jobs lost. No situation could compare with that. What I would like to compare at least in some way is how we handle failure. Kyle Williams committed two very public, costly errors that contributed to the San Francisco 49ers losing their NFC Championship game this past week. As an athlete in a business like football, he knows more than anyone else that he blew it. No one needs to threaten his life, as at least one person has in the wake of this game. He feels awful for his teammates, especially when he fumbled a punt return in overtime that led to the winning overtime field goal for the Giants just a few plays later. How does he handle it? How do we handle it when we blow it? A football game is not that important in the whole scheme of things, I know. But when you let others down in a big way, how do you bounce back? Kyle Williams was asked today, in a radio interview with Dan Patrick, what his father, a sports General Manager for the Chicago White Sox, said to him after the game. Williams said that his father was the first person he saw when he left the locker room. His father said this to him, “Are you tough enough? Are you man enough to handle this?” Kyle Williams’ father Kenny knew that the answer was yes. Kenny Williams was confident enough in his son Kyle to know that Kyle would bounce back from this. I assume that’s because his father knew his son well enough, and he had taught Kyle enough from his own experience, to be confident that his son had a good foundation. Kyle’s father was there for him in his failure. Captain Schettino did not handle his failure well. He ran away from it, he wouldn’t deal with it. Kyle Williams, on the other hand, acknowledged his mistakes and is ready to learn from them. How about you? How about your children, fathers and mothers? Are you preparing your children to avoid situations of failure compounded, like Captain Schettino? 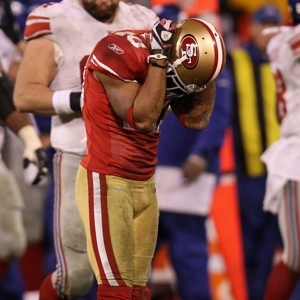 Have you taught your children how to deal with failure, to bounce back from it and learn from it, like Kyle Williams? Have you laid for them and with them a rock solid foundation? You can find that foundation in Jesus Christ. He is the only sure, rock solid foundation.